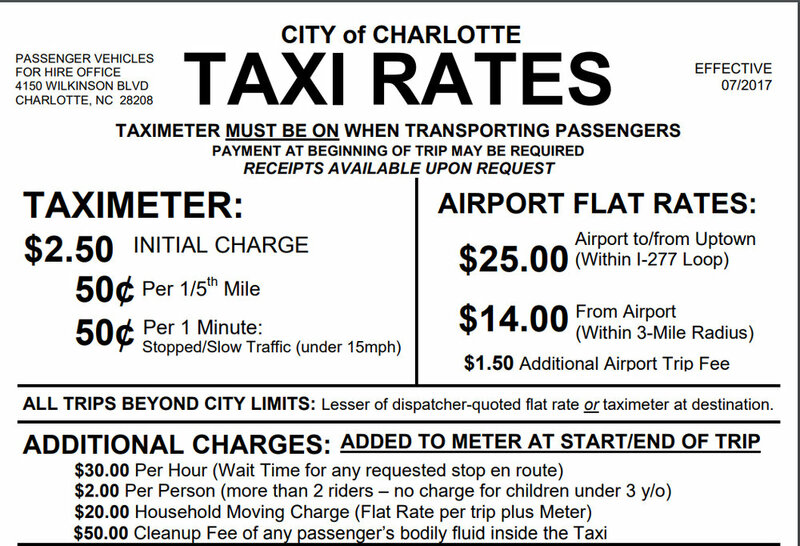 The rates charged by Charlotte taxicab companies and their cab drivers are set by the City of Charlotte. Use the information to estimate for next ride with Cab Hound. The actual cost of a fare is calculated based on the meter in the taxicab. Charlotte-Mecklenburg Police Department's Passenger Vehicles for Hire (PVH) Office sets the taxi rates for the city of Charlotte. Where are the taxis at Charlotte Douglas Airport (CLT)? Taxi service is available curbside, on the Baggage Claim level. An attendant is on duty to assist passengers from 6:45 a.m. – 12:15 a.m.
What taxi companies serve Charlotte Douglas Airport (CLT)? Although passengers may prearrange to use any taxi service provider, there are four taxi companies available through the Airport’s taxi queue: City Cab, Crown Cab, Green ab and Yellow Cab. These companies are evaluated annually to ensure all taxis have a GPS system, credit card technology and adhere to guidelines set forth by CLT. How much is a taxi to / from Charlotte Douglas Airport (CLT)? There is a base rate of $25 for taxicab rides to Charlotte. The fare is only $14 with 3 miles of the airport.